I have to admit I have not been a big supporter of the Assiniboine Park Zoo. I haven’t taken my own children since Shay was 4 (6 years ago) and haven’t been on a field trip to the zoo in well over ten years. As a family, we have had the opportunity to visit a few really great zoos when on vacation. We’ve been to the Calgary Zoo, San Diego Zoo, San Diego’s Wild Animal Park, Animal Kingdom in Disney and one of our favourites, the Columbus Zoo in Ohio. When you go to a really incredible zoo, it is a whole day adventure. You expect to pay more, but its a full day trip. For me, packing up the kids to travel across the city for an hour or so, just never seemed worth it to me. The animals were usually sleeping or so camouflaged in their enclosure that you couldn’t even sneak a peek at them. Despite my bad attitude towards our zoo, I got really excited about all of the press regarding the changes and plans for the zoo. When I was choosing my field trips for this year, I decided it was time to check out the zoo and give it another chance. Last Thursday, I took 46 kindergarten students to the zoo for the day. We did a program in the morning and then had time to explore on our own. I wasn’t totally impressed by what we saw, as there was still lots of construction going on and many paths were being re-routed. However, those areas that had been upgraded since my last visit 6 years ago were vast improvements over the old facilities. I am actually really excited about the Journey to Churchill exhibit that is scheduled to open July 3rd and I will absolutely be paying the big ticket price to take my kids. 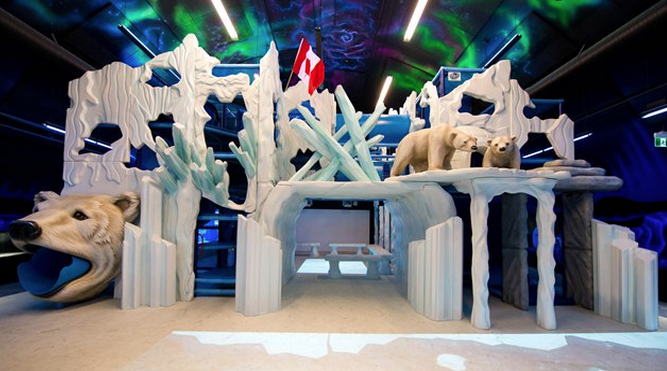 The Polar Playground is really cool ~ literally, it is an indoor play structure that provides a great escape from the hot sun. The large room has very low lighting and the play structure has many interactive features for the kids to explore. I had never seen this before and was very impressed. I’m not going to talk about the Journey to Churchill exhibit as this video gives an awesome description of it. Until visiting, I must admit that I had a bit of “let’s just wait and see” attitude. I really wasn’t all that impressed with the snip-its I saw on the news, but when you see the size and grandeur of the construction, it is quite impressive. I think what I like the most is that I can see that there is a “big plan”. I am such a believer in thinking big, having a big goal and then taking the necessary steps to get there. This is only the beginning of their “big plan”, but I think Winnipeg is finally on the right track. To me, this kind of exhibit is similar to those you might expect to see at other world class zoos. I know it will be years in the making, but I really think this will help put Winnipeg on the map and bring tourists from all over. If you are/were skeptical like me, check-out this video and I think you too will be impressed with the design and forward thinking of those behind the scenes. I for one am excited about the new exhibit and will no longer be “pooh poohing” the zoo. If you do plan to take your family to the zoo, don’t forget to check-out the Nature Playground and Duck Pond in the park. They really have done a beautiful job of taking the park to a whole new level as well. The upgrades are wonderful and you could easily pack up the family and make a day of it. So exciting! Posted on June 10, 2014 by Cindy Roy •	This entry was posted in Family and tagged Assiniboine Park Zoo, Journey to Churchill, Winnipeg Zoo upgrades, Winnpeg Zoo, Zoo upgrades. Bookmark the permalink. ← Repurposing Coke Bottles: So Cool!